Seth Godin is one of the most influential business writers of the last decade, with a litany of relevant topic books (Tribes, Small is the New Big, Permission Marketing, Purple Cow) and his latest offering LINCHPIN, (Are you indispensible? ), which addresses the ultimate role a person plays with their own professional life. This subject is timely given the dramatic shift in work force parameters in the past two years. Long gone are promises of long-term stability with any position it seems, and Godin is quick to point out the sources and solutions to this phenomenon. According to Godin, in the beginning (Genesis reference intended) our American education system was created for us to be trained and prepared for jobs where we are essentially a cog in a wheel, doing what is dictated, with the reward of long-term security and a decent salary. Corporate owners for years sought ‘compliant, low-paid, replaceable, cogs to run their efficient machines”. This model according to Godin persisted until recent economic upheavals made the dynamic dysfunctional for many modern day workers. This is amplified by the advent of out-sourcing of work offshore and further mechanization of many human work tasks. Today, the working class generally is never guaranteed a job, is paid relatively less, and must be more versatile in order to survive, let alone thrive. This also includes management employees that are paralyzed by efficiency driven policies that are guided more by stockholder earnings than a regard to long-term employee loyalty. A third team has emerged during this time that Godin appropriately labels “linchpins”. Linchpins make themselves invaluable by creating relationships, adding an artistic element to their work, and creating new ways of doing things. Imagine there are no bounds to your creative abilities. Now imagine the work you did everyday included this creativity and the opportunity to include artistic expression into it as well. After the consummate background that explains the evolution of the linchpins, Godin uses biopsychology, easy to adapt skills, and honest challenges to readers to change their mindset and unleash their artistry and unique genius. Incorporating many of these hidden skills is essential to both finding one’s niche in the new workplace and sustaining job satisfaction. Linchpins have the opportunity going forward to “invent, lead (regardless of title), connect others, make things happen, and create order out of chaos”. Godin solidifies his theory with compelling references from recognized and respected experts. Too many on-topic business books form a first chapter premise and spend the rest of the reader’s time dwelling on repetitive regurgitations. Godin’s writing style however, is conversational and relevant in a short sectioned-out formats that flow easily from one to another. 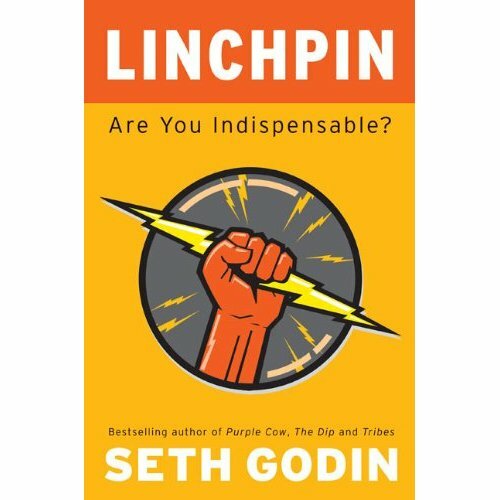 LINCHPIN, Are You Indispensible? is an essential read for anyone who finds themselves at a professional crossroads, and can take the time to identify what it will take to be a building block in a great organization and to love their work at the same time. This entry was posted in Partner Resources, Resources, SBTDC and tagged book review, Partner Resources, workforce development. Bookmark the permalink. 2 Responses to LINCHPIN, Are You Indispensible?